Wake is a large scale sculpture erected in 2004 by Richard Serra. 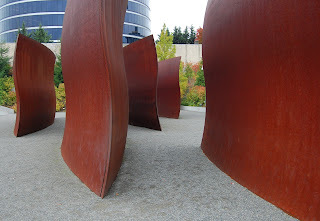 It is difficult to understand the exact shape of the steel while walking around it. From above, you can see a bit more, but that contradicts the different wavy shapes seen edge-on.